Donna Karan Home Rhythm Velvet Pillow, 16" x 20"
Donna Karan HomeRhythm Velvet Pillow, 16" x 20"
Velvet pillow is made of cotton/rayon. Velvet diamond-quilted pillow. Knife edge with zip closure. Feather/down insert. Polyester; spot clean. 14" x 20". Made in the USA of imported materials. Austin Horn Classics Rowen Velvet Pillow, 20"Sq. 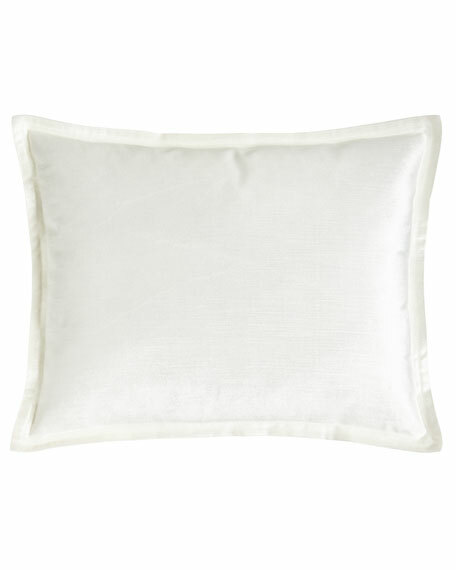 EXCLUSIVELY AT NEIMAN MARCUS Solid velvet pillow with self welt cord. Hidden zip closure. Polyester; dry clean. Feather/down insert. 20"Sq. EXCLUSIVELY AT NEIMAN MARCUS Solid velvet pillow with self welt cord. Hidden zip closure. Polyester; dry clean. Feather/down insert. 20"Sq. Made in the USA of imported materials. EXCLUSIVELY AT NEIMAN MARCUS Square pillow. Dark chocolate scrollwork. Dry clean. Made in the USA of imported materials.